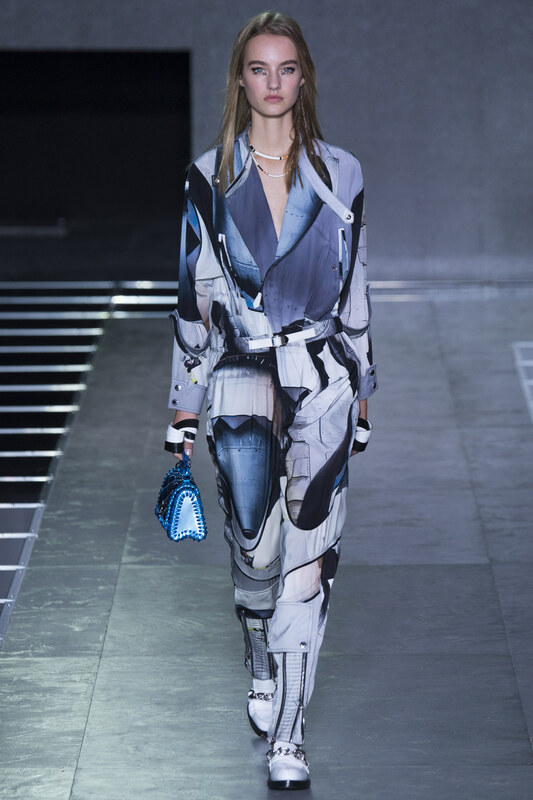 Well, there is never a dull moment on the Louis Vuitton runway thanks to the ever changing always unique concepts of Nicolas Ghesquiere. The pieces are mod and fashion forward even with the occasional nod to Victoriana in the form of some puffy sleeves and a ruffle or two. 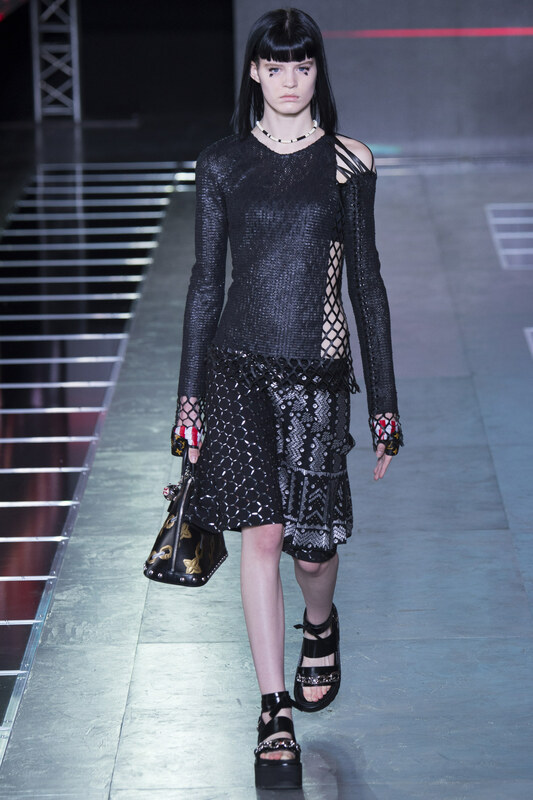 (I'm guessing the RUFFLE gene is X linked, because you can't swing a Fendi bag and not hit a cluster of ruffles on the runway these days). 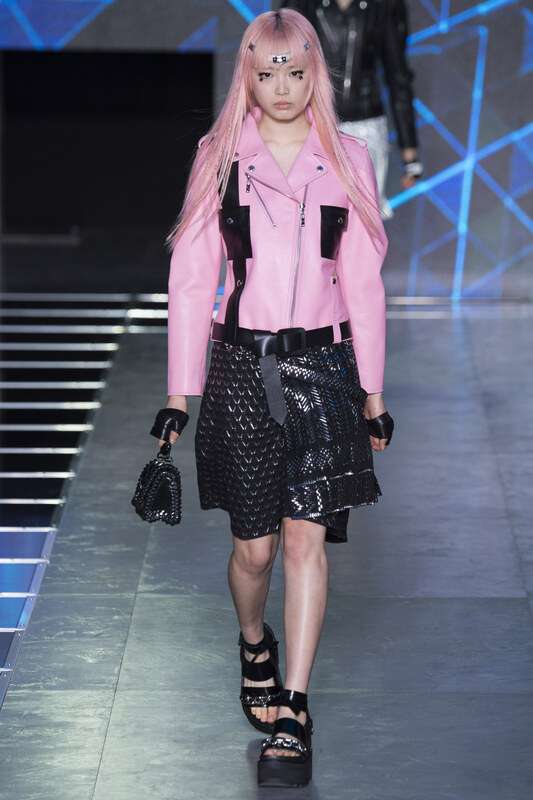 Leather looms large in the form of a spectrum of jackets in varied silhouettes and themes including the expected black, clever and curious patchwork, and two knockouts in pink and raspberry! 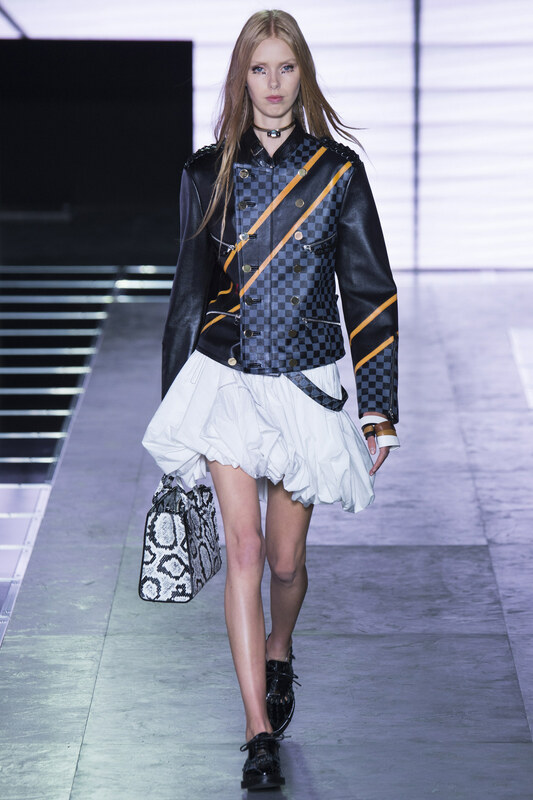 Everyone from the chic biker chick to the hip fashionista to the lover of the iconic LV monogram will find themselves intrigued and pleased by the display. Short and fitted for the glamour puss and longer and loose fitting for everyday tooling around, to be thrown over a T shirt and jeans. If the Devil is in the details, fear not because no one does impeccable and intricate like the house of Louis Vuitton. Case in point? The finished button holes, a rarity these days even in incredibly lux fare. A healthy dose of black makes an appearance, but its anything but banal. Some skin is shown. Asymmetry and abstract adornments add upscale edge to the tops, floor length dresses, and skirts, the latter some of the most astonishing and ravishing on the spring runways given the degree and pattern of embellishments. Black, spring, go figure. And the best part about the black leather skirt? The facile transition to fall winter. And rounding out this mesmerizing collection? 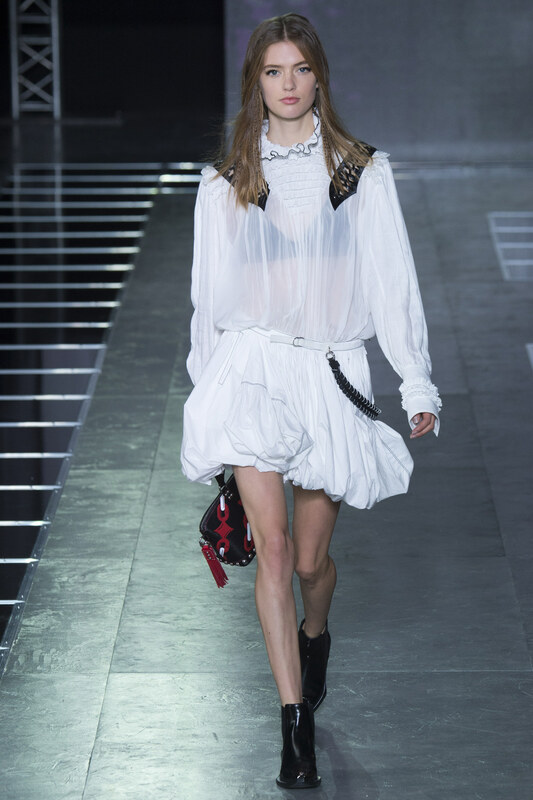 White knee length billowy white dresses which seem to have been conjured from a parachute, a black leather vest, and new age multicolored motorcycle pants with zipper detail. Once again, the accessories including the shoes and purses are some of my personal favorites (along with Dolce & Gabbana), and amongst the most covetable. I know what I want in my Christmas stocking, pretty much any of the spectacular elements in this awesome assembly. Pink, the perfect foil for black leather. The cotton candy element tones down the gothy black. 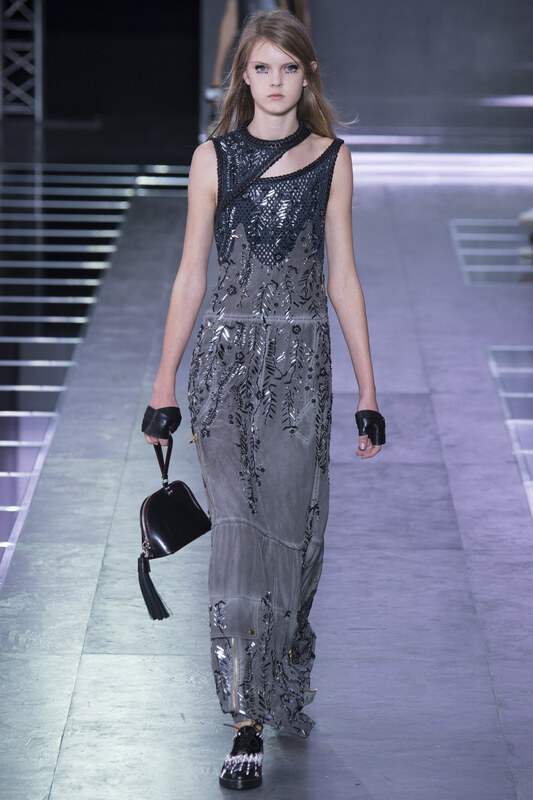 An upscale urban Mad Max vibe pervades the collection. Zowie! 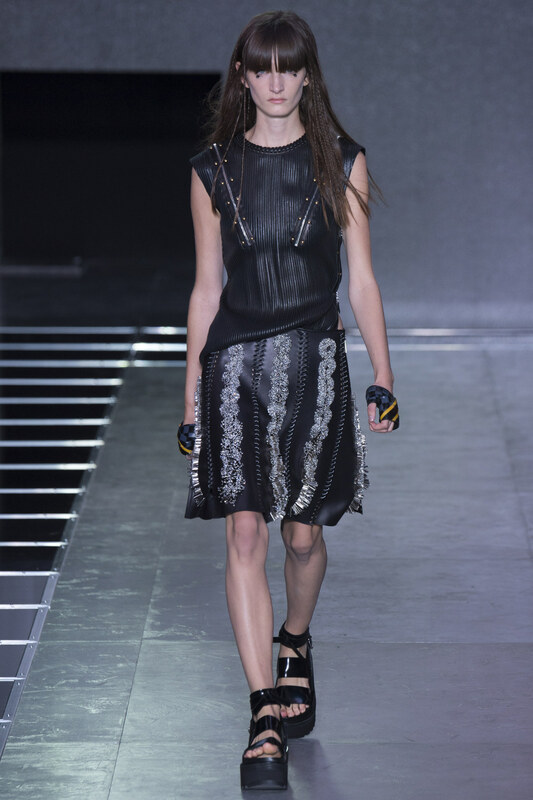 Now that is the way to turn a black leather A line skirt into a show stopping focal point. A little skin, some asymmetry, for visual interest. We always need an option to the usual ball gowns. Mad Max at the Thunderdome meets a version of Bohemia. Heh. I am loving this skirt asymmetry…..merrily unexpected. 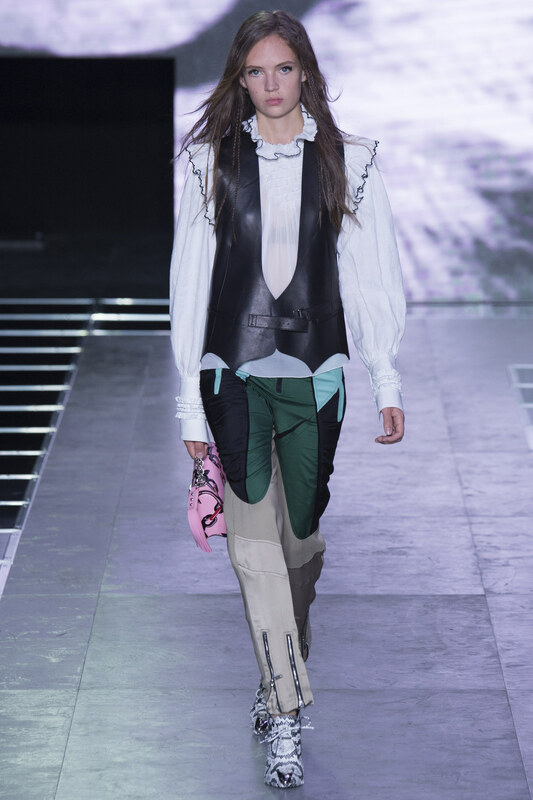 The billowy blouse provides a clever contrast to the space age moto pants with the zipper detailing. These are some WAY cool trousers! Another fetching tunic-dress. Definitely calls for shoe booties. Now, normally I abhor blatant attempts at foisting brand initials and such on the public, LV or GG or CC, etc. But somehow, with the patchwork it becomes palatable and appealing. And check out the finished button holes. 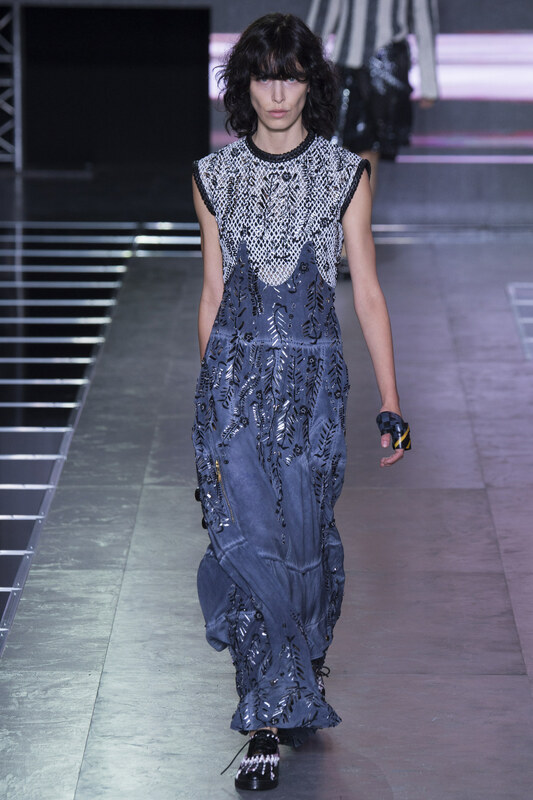 (IMHO, ALL runway pieces should have covered button holes, the exception being full on grunge). 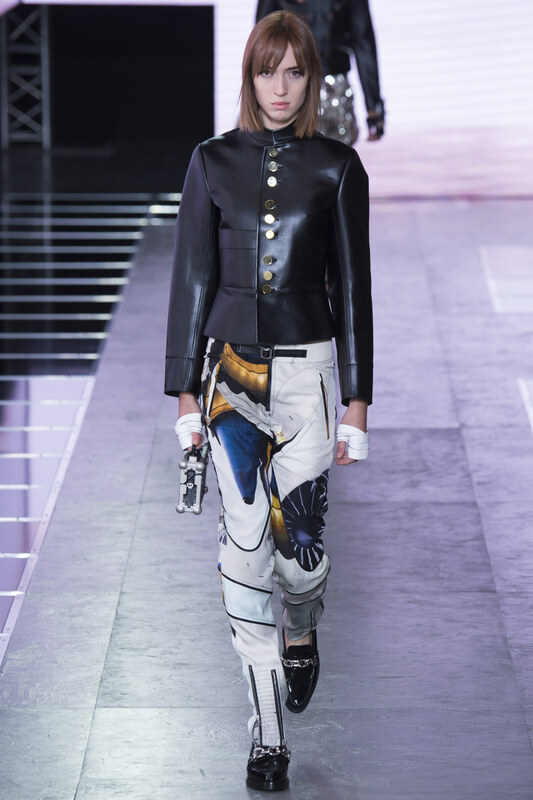 A definite STUNNER in a stellar cadre of leather. The raspberry red is not TOO red, but has a smidgen of blue, easier on the eyes than the orange version). Modern day gal armor, feminized with a bubble skirt…. 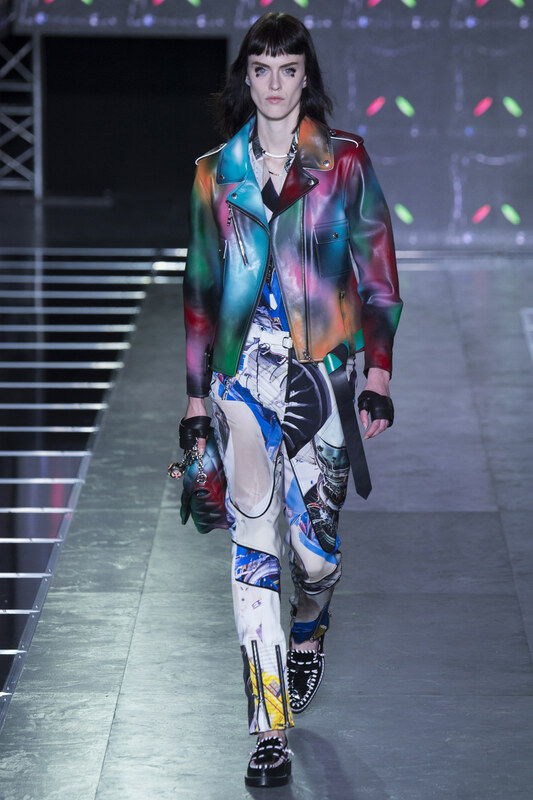 An impressionist take on the Moto jacket, akin to a watercolor melange. 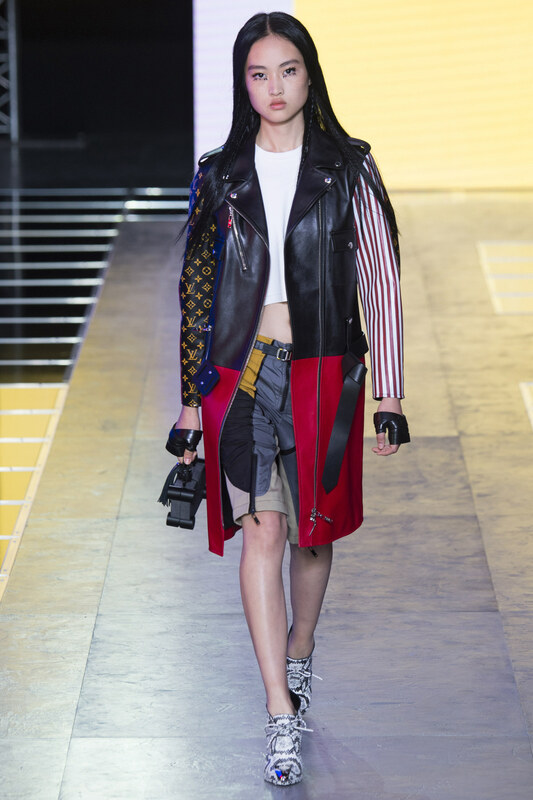 (Joins the exclusive club along with Christopher Kane, Gucci, and Undercover in bringing the fem-glam black leather jacket). Well, apparently the SF Giants are OUT this season, but Ghesquiere hits a home run with a singular collection leaving everyone wanting more.